The Under 19 inter-school cricket encounter between St. Joseph’s and St. Anthony’s Katugastota played at Darley Road ended in a dramatic eight wicket win for the Josephians which was also their second outright win for the season yesterday. An outright win for either of the team was not on the card after the first day’s play got off only at 1.35pm with the Antonians ended the day on 129 for 8. 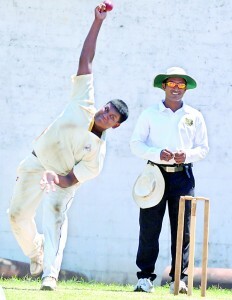 The second day’s play saw St. Anthony’s resuming on their overnight score adding a further eight runs being bowled out for 137. St. Joseph’s in reply making steady progress went into lunch on 103 for 4 and then going for quick runs they succeeded in only losing wickets at regular and ultimately declared their innings on 143 for 9. It’s from here on that the game took a dramatic turn as St. Anthony’s batting the second time found spinners Moditha Weerasinghe and Aravinda Akurugoda too hot to handle. Wickets began falling like nine pins which ended in the Antonians succumbing to their lowest ever score of 35 against the Josephians with Moditha and Aravinda sharing eight wickets between them. According to sources the previous lowest score of the Antonians against the Joes was 40 in 1909. However St. Joseph’s left with a simple chase of 30 reached the target in the seventh over to take the Muralitharan-Vaas trophy. 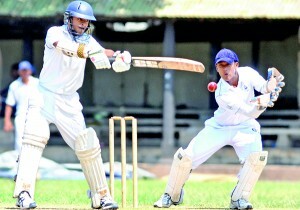 At Bambalapitiya St. Peter’s registered an easy first inning win over Joseph Vaz while in the Ranil Abeynaike encounter between S. Thomas’ and Trinity ended in a tame draw.